I know most of you are freezing cold. Really, really cold. Snow in New York City. Laurie Halse Anderson's sweat is frozen to her post-jogging face. Neil Gaiman's in diamond dust snow in Minnesota. My son Will, also in MN, would probably be in diamond dust snow as well except that he's a lab rat and never gets out. So I'll share with you two wonderful pictures by the amazing illustrator Katherine Tillotson. These are from her neighborhood in San Francisco. 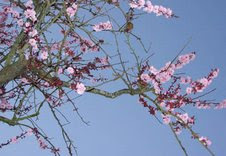 She says: "The street is brick paved and lined with blossoming plum trees on both sides. If I time my walks just right I can walk through drifting pink petals and hear the wind chimes in back yard. It is very magical." Enjoy. Lift your face up and feel the rays. Smell the delicious flowery dusty smell.